In July 1969, Michael took a bus to Toronto to visit the community of seekers for a weekend. A number of young people lived there, guided by a leader, a spiritualist guru. Michael was welcomed, and he was impressed by their efforts at achieving contact with the other world. He stayed up long into the night speaking with them about spiritual matters, especially reincarnation. They did not look like hippies at all and there were no drugs; they were “clean-cut guys”, as Michael later recalled. In the middle of the night, while sleeping on a mattress, alone in a tiny room, Michael suddenly awoke with the terrible feeling that there was an evil presence in the room. Approaching him, he felt, was an extremely malevolent spirit who wanted to devour his soul. He, who had rejected the personal Christian God, replacing him with vague cosmic forces, was suddenly confronted with an experience of an intensely powerful and hostile spiritual presence, which seemed impossible to resist. Feeling like a defenseless prey in front of a large predator, Michael went through a complete religious transformation. Utterly terrified, he cried out from the depths of his soul, “God save me!” Instantaneously, the evil presence withdrew. It was still there, but backed off, and a supernatural peace filled Michael—something he had not felt for many years. Michael did not merely experience an all-embracing, loving kindness that melted away his darkness and sins. He realized, first, that he, and mankind as a whole, was under attack from an absolute evil, mostly disguised as good. Then he felt the undeserved grace of God, which rescued him from falling into the abyss. This experience provided Michael with a sense of urgency, I would say with a sense of prophetic mission, which became clearer to him as the years progressed. In the middle of that night, Michael became aware of what he calls the Great War in the Heavens, which is an allusion to Revelation 12:7–13, in which his namesake, the archangel Michael, plays a leading role…Early the next morning, Michael said goodbye to his hosts and took the bus home. He remembers that when he passed the central plaza of Toronto’s city hall, he saw thousands of people staring at large screens displaying the moving black-and-white videos of a man walking on the moon. It was July 21, and a small step on the dusty surface four hundred thousand kilometers away was matched by a giant leap in Michael’s soul. Prayer: Psalm 23 - The Lord is my shepherd; I shall not want. He maketh me to lie down in green pastures; He leadeth me beside the still waters. He restoreth my soul; He leadeth me in the paths of righteousness for His name’s sake. Yea, though I walk through the valley of the shadow of death, I will fear no evil; for Thou art with me; Thy rod and Thy staff, they comfort me. Thou preparest a table before me in the presence of mine enemies; Thou anointest my head with oil; my cup runneth over. Surely goodness and mercy shall follow me all the days of my life; and I will dwell in the house of the Lord for ever. 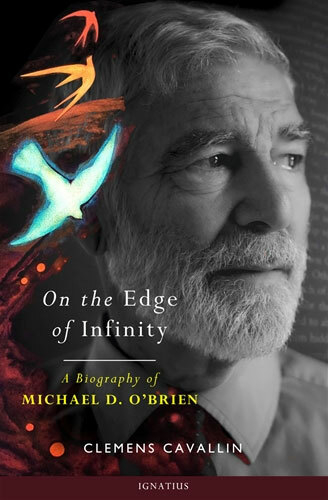 Excerpted from “On the Edge of Infinity: A Biography of Michael D. O’Brien” by Clemens Cavallin.